Stir the Quick Seasoned Mashed Potatoes (see Recipe Note below), green onion and bacon, if desired in a large bowl. Cool the potato mixture to room temperature. Heat the oven to 400°F. Beat the egg and water in a small bowl with a fork or whisk. Unfold the pastry on a lightly floured surface. Roll the pastry into a 16 x 12-inch rectangle. With the short side facing you, spoon the potato mixture on the bottom half of the pastry to within 1 inch of the edges. Starting at the short side, roll the pastry up like a jelly roll. Place the strudel seam-side down on a baking sheet. Tuck the ends under to seal and brush with the egg mixture. Bake the strudel for 25 minutes or until it's golden brown. Heat the gravy in a 1-quart saucepan over medium heat and serve with the strudel. Recipe Note: Quick Seasoned Mashed Potatoes: Heat 3 cups water and 3 tablespoons butter in a 3-quart saucepan over medium-high heat to a boil. Remove the saucepan from the heat. Stir in 3/4 cup milk, 1/4 teaspoon garlic powder and 1/2 teaspoon salt, if desired. Stir in 4 cups instant mashed potato flakes or buds until the water is absorbed. Proceed with the recipe as directed. 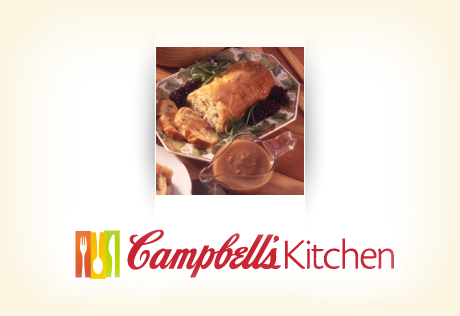 Flavor Variation: Also delicious with Campbell's® Beef Gravy or Turkey Gravy.